"Hal" redirects here. For information about Otacon from Super Smash Bros. Brawl, whose real name is Dr. Hal Emmerich, see Smash Taunt characters § Otacon. For the computer from The Super Mario Bros. Super Show!, see HAL 9001. HAL Laboratory (HAL Labs for short) is a Japanese game developer partnered with Nintendo founded on February 21, 1980 by a small group of friends who shared the desire to create games; among said group was Satoru Iwata, fourth president of Nintendo Co Ltd. The group developed games for numerous platforms at first before developing exclusively for Nintendo. The name "HAL" originates from the fictional computer HAL 9000 from 2001: A Space Odyssey, as well as each letter being one letter before "IBM." HAL Laboratory is most notable for developing the Kirby series, created by ex-employee Masahiro Sakurai; however, they are also responsible for the Super Smash Bros. series and the Mother series. They have also commonly collaborated with other teams within Nintendo. The television set with the name "HAL Laboratory" on it in Super Smash Bros. Melee (click for bigger view). 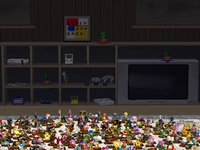 In Super Smash Bros. Melee, if the player selects the trophy collection and zooms in close enough, the television set to the right reads "HAL Laboratory" on it. ↑ Casamassina, Matt (March 10, 2005). GDC 2005: Iwata Keynote Transcript. IGN. Retrieved January 2, 2015. ↑ Madden, O. (November 30, 2012). Iwata Explains Where The Name HAL Laboratory Came From. Nintendo Life. Retrieved August 6, 2018. This page was last edited on April 13, 2019, at 15:25.